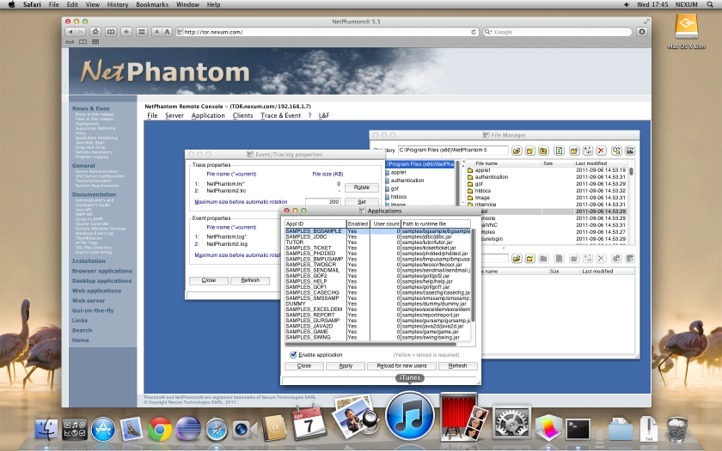 NetPhantom now has support for the platforms Mac OS X and Linux, both for the NetPhantom Client and Server. Please note that "Linux" is a very wide description, it is e.g. CentOS, Debian, Feodora, openSuse, Red Hat, Ubuntu, etc. Also note that the Client support for Mac OS X and Linux is currently in Beta. See Linux Distributions for more information. The full list of supported operating systems is show below. The 32-bit versions of Microsoft Windows 2000/2003/XP/Vista/2008 or Windows 7/8/8.1/10. Linux Kernel 2.6 or newer preferred. Apple Mac OS X 10.6.3 Snow Leopard or newer preferred. The 64-bit versions of Microsoft Windows Server 2003, 2008 (R2), 2012 (R2), 2016, Windows XP/Vista or Windows 7/8/8.1/10. Linux 64-bit Kernel 2.6 or newer preferred. Apple 64-bit Mac OS X 10.6.3 Snow Leopard or newer preferred. SUN Sparc: SUN Solaris 2.6, and better. Intel x86: SUN Solaris 10 or better. With the use of new technologies, the requirements for Java versions are as follows. Java web start and Applet: 1.7.0, 1.8.0. The Java Development Kit should always be used for the server, not the Java Runtime Environment (JRE). It is preferred to use a 64-bit version of the JVM as the Server JIT compiler performs better and larger amounts of memory can be addressed. The minimum Java version is 1.8 update 121 (but we would recommend 1.8.0 update 172 or better). Java 11 (latest version) is also supported.